This is post 2 of 5 posts on Game Theory and it’s application to innovation…enjoy! Game theory is a tool usually reserved for elite academics and brainiacs who enjoy calculus. That’s why many businesses, except for very large or sophisticated ones, tend to not delve into use of this tool. For most people, including entrepreneurs and small business owners, the concept can be intimidating. However, what if there were a way to simplify game theory to a point where it was easy enough for practically anyone to use and still provided valuable insights? That’s what I hope to do with this article. Using 5 game theory examples, I’ll walk you through the process step by step and provide links to tools, articles and blogs that are helpful as well. The fundamentals of game theory aren’t necessarily difficult to understand and sometimes all it takes to understand it is a shift in thinking. The branch of mathematics concerned with the analysis of strategies for dealing with competitive situations where the outcome of a participant’s choice of action depends critically on the actions of other participants. Game theory has been applied to contexts in war, business, and biology. The analysis of strategies in competitive situations where the outcome of a participant’s choice of action depends critically on the actions of other participants. Bingo. That sounds better. Let’s break this definition down quickly. Where the outcome of a participant’s choice of action depends critically on the actions of other participants. For game theory analysis to be meaningful, you have to make some assumptions on what you want (or value) and what your competition wants (or values). For example, when starting a football game you have to assume that both you and your competitor want to win the game. If you don’t assume that your competition wants to win, then the game is meaningless. Same goes for business. In business you have to assume that both you and your competition want to win customers – often the same customers. This assumption, that both you and your competition want to win the game or the customer, is fundamental to game theory analysis. This is what game theory purists refer to as “rational behavior” because it would seem pretty irrational for someone to play a game that they didn’t want to win or one in which they purposefully wanted to lose. Now that we have discussed the fundamentals, let’s get into the examples. For these examples, I’ll be referencing an excel file that you can download here. 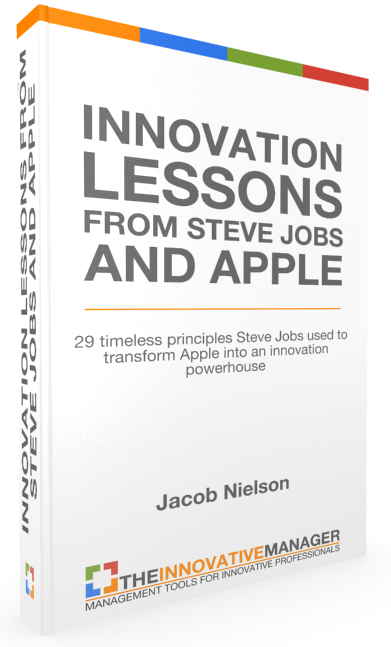 Also note that I will start out by discussing restaurants (a hot dog stand) but later on at the end of the post I will show how this relates very well to innovation. The first example we’ll get into involves the decision of where to locate your hot dog stand. We’ll use a hot dog stand for this example but the reality is that it could be any business – a fast food restaurant, retail store, a gas station, etc. Let’s suppose you were considering placing your new hot dog stand on Main Street in a city called Anywhere USA. Let’s also suppose that you heard from a friend about another person who is planning to open up a hot dog stand on Main Street as well but you don’t know exactly where yet. Let’s also suppose that the citizens of Anywhere USA like both your hot dogs and your competition’s hot dogs equally well – they have no preference between the two. Now because you are a shrewd business person, you know that where on Main Street you decide to locate your hot dog stand is a big decision that will have a major impact on your success. You also know that where the other person decides to locate their hot dog stand will have a big impact on your business as well because they will be going after the exact same customers as you. So you decide to do some serious analysis of Main Street to determine where the best place would be to locate your new stand. And since you have a competitor who’s actions will significantly impact your business, you decide to use game theory to try and predict where they will place their stand and consequentially where you should place yours. To your surprise, there are no other restaurants along Main Street and the sidewalk is completely open! Let’s say your best friend is the mayor of Anywhere USA and since he likes you and your hot dogs so much, he convinced the City Council to pass a City law that states that your hot dog stand is the only lunch food location allowed in town. You jump for joy because this basically means you won’t have any competition because the person who was going to bring in another hot dog stand is suddenly out of luck. Now the question is, where would you choose to locate your hot dog stand? If you’re the only place people can for lunch in town and all the employees in those offices need a place to go to lunch, does it matter where you decide to build? Not really. Unless you have some preference yourself (for example, you have a friend who works at “Office A” and you want to make it easy for him to get to your restaurant), it doesn’t matter where you build because you’re the only choice for lunch. No matter where you build on Main Street you’re still going to get customers from all the offices. So for illustration purposes, let’s imagine you decide to build at location 7W Main Street. This seems like a logical location if you’re a monopoly because even though the employees at “Office G” have to walk 6 blocks to get to lunch (each solid line represents a block while each dashed line represents half a block; the 1W and 1E and so on are addresses along Main), you’ll still get their business because you’re the only place in town. Meanwhile you’ve made your friend happy because he only has to walk out the door (zero blocks) to get lunch. Let’s also assume that your hot dogs are priced at $5/each. Kind of pricey for a hot dog but because you’re a monopoly you can charge whatever you want. 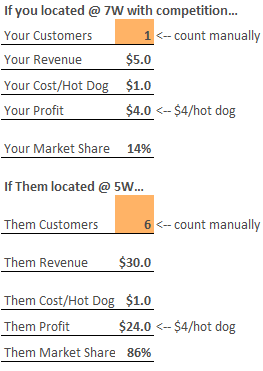 This means that for the employee at “Office G,” their total cost is the $5/hot dog plus the opportunity cost (or wages they could have made if they didn’t have to walk down the street to your hot dog stand) of $6 for a total cost of $11. That’s an expensive hot dog! One day your friend the Mayor calls with bad news: the law that stated you were the only hot dog stand allowed has been repealed. And as a result, you find out that a competitor is going to open a hot dog stand on Main Street as well. Your monopoly is over. Instead of sit back and sulk about your situation, you decide you want to anticipate their moves before they setup their stand and so you start to run a few scenarios. For example, if you’re still located at 7W, where would your competition decide to locate? Where would you locate if you were in his shoes? 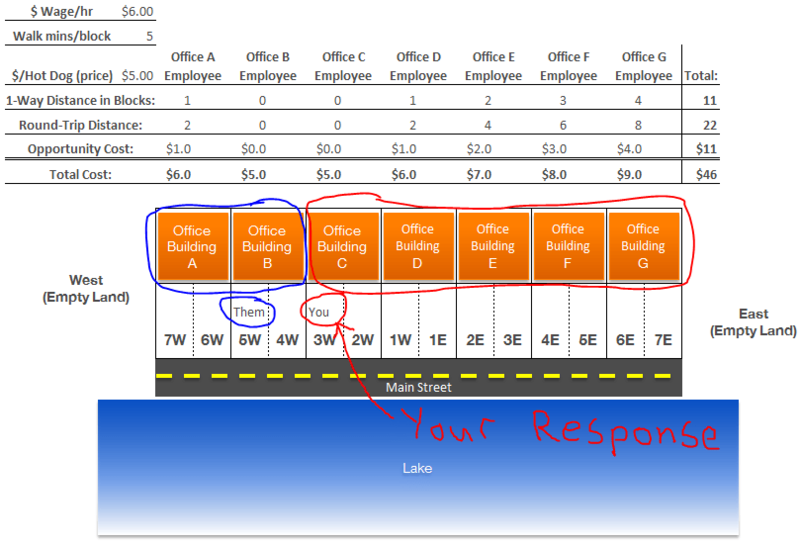 What position on Main Street would provide your competition with the most customers and profits? Notice that in this scenario the opportunity cost for all customers except from “Office A” is now lower than it was in the monopoly scenario. This is because the competition is one block closer to all the other customers. Basically what “Them” is doing is allowing “You” to keep your customer at “Office A” while making it a no-brainer for all the other customers to choose “Them” because they’re closer – if even just a little bit closer. Just to be fair, let’s assume that the hot dogs from both stands taste the same. As you think through this scenario, you start to wonder what you would do in response to “Them” locating at 5W. You realize that all you need to do to regain your prominent position in the market is to cut “Them” off in the same way they did to you. So you start thinking about a new scenario and what would happen if you located at 3W. Now note that in this scenario you’ve made it a better proposition for customers from office buildings C, D, E, F & G. Your competition, “Them,” will now only get customers from office A and B. Good move! 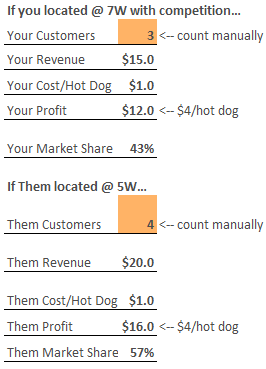 With all this analysis you realize that you could do slightly better, but not necessarily better than the competition, by locating your hot dog stand at address 1E – right next to your competition! 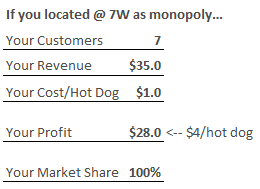 So if you ended up locating your hot dog stand at 1E, right next to your arch rival “Them” at 1W, you will split the total market and assuming employees at office building D make a random choice, they’ll choose your stand half the time and your competitor’s stand the other half of the time. This now begs the question, should “Them” now move further East? Given all the previous discussion, the answer should be clear that if “Them” decided to move further East it would open up more customers to you and be detrimental to their business. The same goes for you and your hot dog stand. If you move in either direction, East or West, you would likely lose sales because your competition will inherently gain an advantage. So the equilibrium solution to this game of location is to put your hot dog stand right in the middle of your customers. Wait a minute. This sounds pretty strange. After all this analysis, the conclusion is to locate your business right next to your competitor? Well…yes. That’s the conclusion. And if you think about it, this is actually what restaurants do in most cities. Think about the last time you went to McDonalds. Was there also a Burger King or Wendy’s fairly close by as well? Usually they tend to form clusters like this and now it makes sense why. But this framework doesn’t just apply to restaurants and fast food franchises. Think about political campaigns. When a candidate moves from the primaries into a general campaign, their partisan tone tends to be a little less pronounced and they often try to scoot “closer to the middle” so as to appeal to the majority of their “customers” or voters. A voter is only going to vote for the candidate that most closely matches their own political opinions. If many of the voters up for grabs are political centrists, then the candidate needs to make sure he or she can appeal to them more than their competition does. This often results in so much of the “flip flopping” that happens to candidates. The trick in a political campaign is to flip flop without giving off the impression that you flip flopped. Let’s say you are a B2B engineering and manufacturing company that has an opportunity to build a widget for 7 different customers – A-G. Customer G wants the widget to be 4″x4″x4″ (Length x Width x Height) and is forecasting to sell 10,000 pieces per year. Customer B, on the other hand wants the widget to be 4.5″ x 4.5″ x 4.5″ and is forecasting to sell 1,000 pieces per year. Let’s assume that for both companies, G and B, their forecasts have usually been pretty accurate in the past. 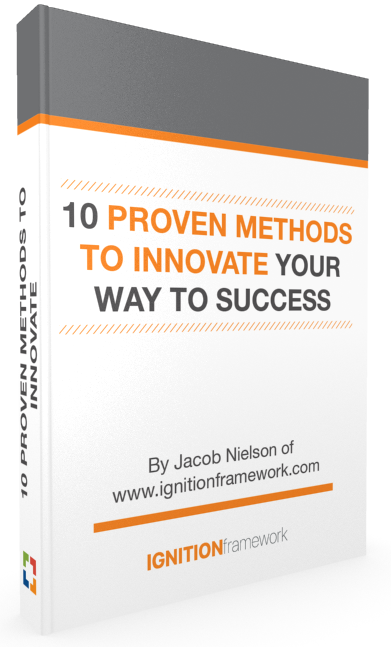 Like most organizations, you have limited resources and can choose to only design and build one widget. Which widget will you decide to build? In this simple example the answer is pretty obvious: make it 4″ x 4″ x 4″ and risk either losing customer B or forcing them to modify their design to accommodate the smaller widget. This cost of accommodating your slightly different design is analogous to the cost of walking for the people in the example above. Now consider what would have happened if you “split the difference.” Let’s say you really wanted to get both customers and that both customer B and G said they could accommodate a slightly different size but at some cost to them. So you decide to “split the difference” by designing a widget that is 4.25″ x 4.25″ x 4.25″. If you have competition, what will they decide to do? They’ll do essentially the same thing as what the competition did in the hot dog stand example – cut you off by getting closer to the customer. So for example, they’ll probably ignore customer B and cut you off with customer G by making their design 4″ x 4″ x 4″. Notice that the outcome of this game is essentially two products from different competitors that are exactly the same. This is what some people have referred to as the “Principle of Minimum Differentiation.” In many cases, especially with commodity goods, this is the most rational strategy. 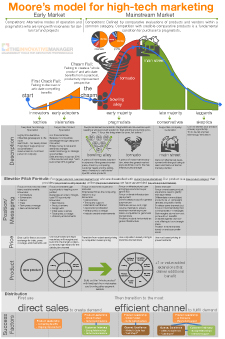 Even in markets where products claim a high degree of differentiation, such as high-tech, the most successful products tend to be those that maintain some degree of commonality with competitors so as not to disrupt the consumer’s learned preferences too much. One example is the Nest Thermostat. When Nest designed the product, they could have made the design any shape they wanted to. But instead, they took cues from the most successful thermostat ever made up to that point – the Honeywell round – and incorporated the same design and customer interface cues that made that product so successful. From a certain point of view, all that Nest did was update the design of the Honeywell round to include better connectivity and a touchscreen display. This conscious design choice by Nest is what makes it much easier for consumers, many of whom have the Honeywell round, to switch to the Nest. For more information on this, search the internet for Hotelling’s game and you’ll find many other examples. I hope this article was helpful in explaining one of the core concepts of game theory. There are many more ways to apply game theory to innovation such as with pricing, ect. that I’ll explore in the coming weeks.